After last year’s Hummazing Month of Hummus for Vegan MoFo, we had decided to take a break from hummus for this year’s Vegan MoFo. So Ash and I got together for a cooking date to create our first lunch recipe for Vegan MoFo. 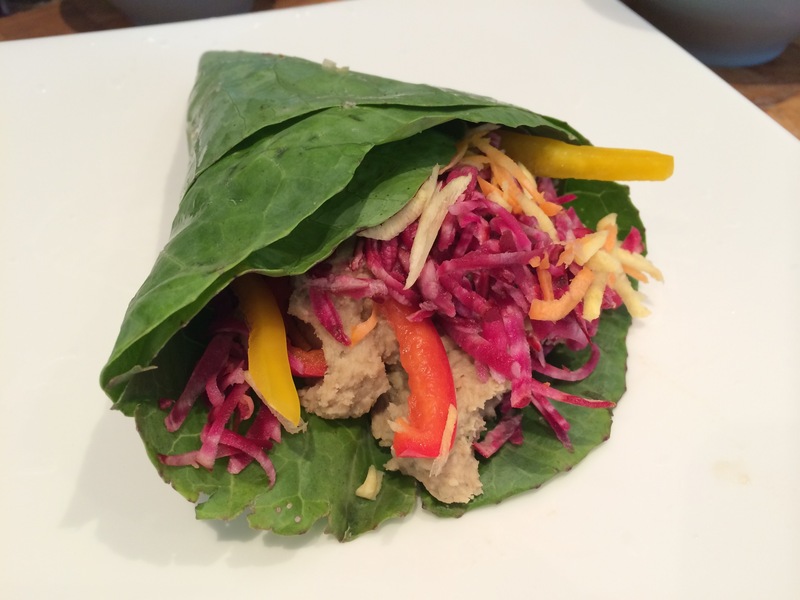 We decided we’d make collard wraps, and fill them with pâté and fresh veggies. 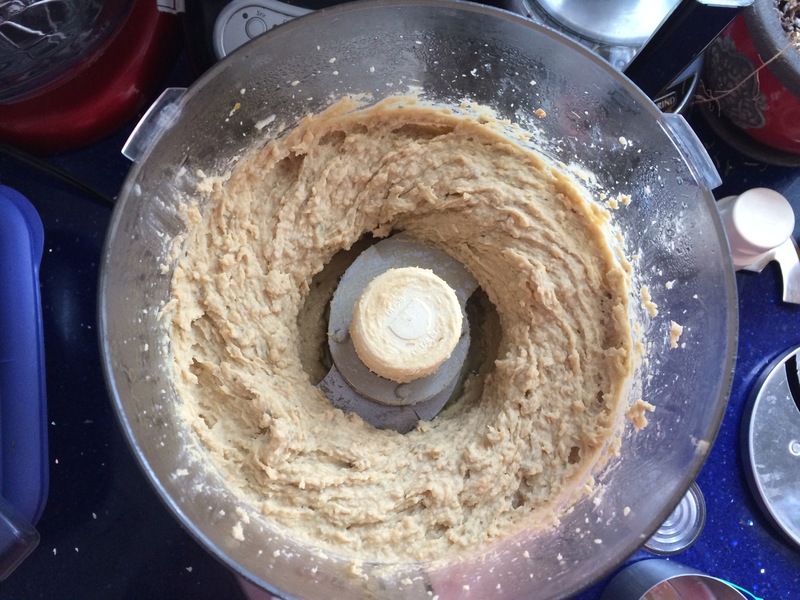 Off we went, cooking up a storm in my kitchen, and as we put the lentils in the food processor we realised… we were making hummus. It was with lentils, and we were calling it pâté, but really… hummus. Obviously we just can’t help ourselves. So we had to make the video to share!!! Whether you call it lentil pâté or hummus, this is a pretty delicious concoction. 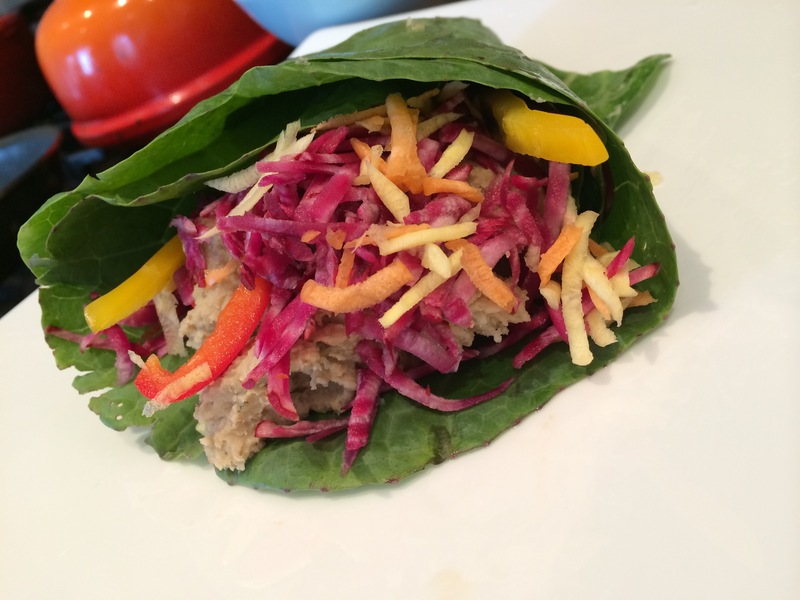 We enjoyed it straight out of the food processor, but it’s a perfect filling for a collard green wrap. If you haven’t wrapped something in a collard green before, it’s pretty easy. Just cut out the centre stem, and roll it around your filling! I like to wash the collard leaves in hot water, as it softens them up just a little bit before you roll them. 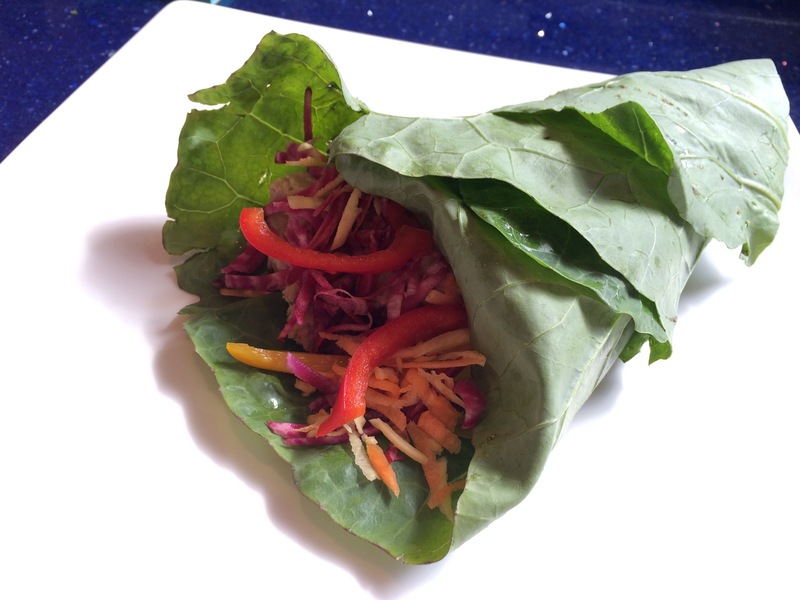 Collard wraps are an easy way to get in another serving of vegetables — both inside the wrap, and the wrap itself! This pâté would be delicious as a spread for bread or crackers, or even as a dip for raw vegetables. Serves 4. Begin by making the Red Lentil & Caramelized Shallot Pâté: In a large pan, heat the 1 Tablespoon of olive oil over low heat. Add the shallots, garlic, balsamic, and salt, and cook over low heat until the shallots are super soft, about 20-30 minutes. While the shallots are cooking, bring the vegetable broth to a boil in a pot over high heat. Add the lentils and turn the heat down to a simmer. Cook for 15 minutes, until the lentils are tender. (Drain any extra liquid). Place the sunflower seeds into a food processor, and blitz until smooth. Add the cooked lentils, the shallot & garlic mixture, and the herbes de Provence. Blitz the mixture until you get a super-smooth pâté, scraping down the sides with a spatula as necessary. Begin to add the extra 1/4 cup of olive oil, a Tablespoon at a time, to make the pâté even smoother. Add up to 1/4 cup of olive oil, to your taste and texture preferences — the more oil you add, the silkier the pâté will be. 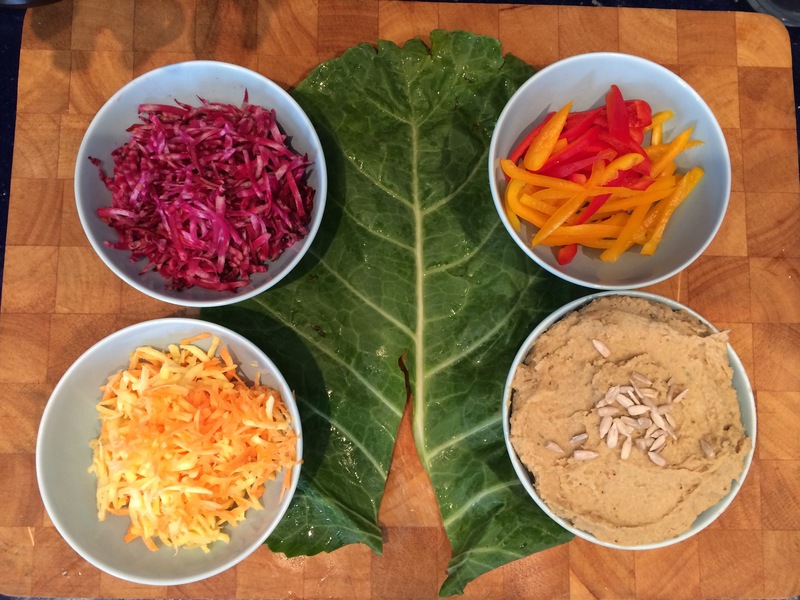 Assemble the Collard Wraps: Take each collard green, and remove the hard middle stem (by cutting out a triangle-shaped section). Spoon a big scoop of lentil pâté into the centre of the collard green, and top with the fresh vegetables (red pepper, beets, and carrots). Roll up, and eat with delight! This sounds so simple, yet so delicious 🙂 happy mofo. Thanks, the pate was so good I’ve been enjoying it for all my other meals since making it! Happy MoFo!! What a delicious looking wrap! This is one wrap that I can make and take to work (I work in a nut-free environment). I love that! And caramelized shallots – oh, yum! We purposely made it nut-free, so I’m so glad that helps you!!! !